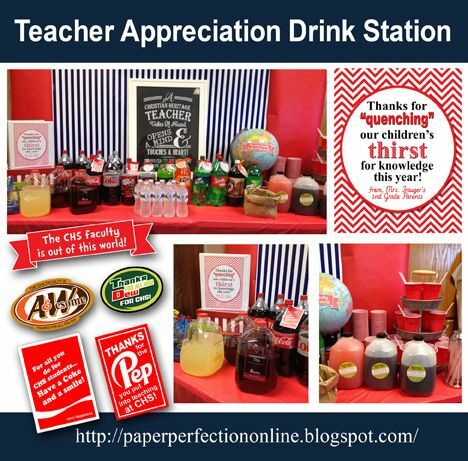 I created a "drink station" for my child's teacher appreciation week at school and thought I would show it off for anyone trying to come up with an idea for their school. I was able to use a lot of the employee appreciation soda tags that I sell with my employee appreciation tags found here and I created a custom water bottle label using a school logo I designed. I also created several signs including an "CHS FACULTY IS OUT OF THIS WORLD" banner for the globe, a chalkboard sign that says, "A CHS TEACHER TAKES A HAND, OPENS A MIND & TOUCHES A HEART. THANKS FOR ALL YOU DO FOR OUR CHILDREN!" and finally a smaller sign that says, "THANKS FOR QUENCHING OUR CHILDREN'S THIRST FOR KNOWLEDGE THIS YEAR! FROM, THE 2ND GRADE PARENTS". The large chalkboard sign measures 18x24" and I was able to print it like an architecture print for $3.50 at Kinkos. This is a great and inexpensive teacher appreciation gift that makes a BIG impact. We have 9 children in our class and I asked the parents to help provide 3-5 bottles of soda, tea, etc. So for $5-10 per family we provided enough drinks for our staff to enjoy something fun to drink all week long. I contacted the local sonic about buying ice and they offered to give it to us for free since it was for teachers so I got 60 pounds sonic ice for $0...you can't beat that price and who doesn't love sonic ice! If you need a few printables to push your teacher appreciation event over the top contact Paper Perfection at jtanddolly@yahoo.com for pricing and details.